Do you have a dining table at your place? We had one at our apartment, but rarely used it. I confess: We're coffee-table eaters. Just the two of us, we don't really take the time to sit down at a table at home to eat our meals (unless, of course, we choose to eat outside on the deck). However, with our new living-room couches sitting much higher than our old, incredibly-low-to-the-ground couch from the apartment, our coffee-table dining has become a little.... awkward. After a few weeks hunched over, straining our backs to eat our meals, we decided a dining table was a necessity. We already loved the look of our "French room," and were worried putting a large dining set in there would clutter up the room, but we realized function was more important in this case, and decided to add one in that space. But.... I don't know if you've looked around recently, but dining sets are expensive. Good grief, I didn't want to drop down another $1,000+ on a place for my food and laptop to sit. So, what do you do if you're a cheapskate in need of a home necessity? Make it yourself! I'm a huge fan of the rustic table look. I love the look of old, worn wood, and I really wanted that to balance out some of the more modern touches in the French room. Plus, how many times have you looked at big, rustic, wood-planked tables in a store and thought to yourself, "Hey, how hard can it be to make that?" The answer: Actually, not too hard at all. Do you recognize the white legs the tabletop is affixed to? Waaaaaaay back when (which happens to be, like, a few months ago), we painted a couple thrift-store tables we already had all white. We weren't sure exactly what we were going to do with them in the house, but liked the end result. Oh hai, chartreuse apartment wall! I kinda miss you! Once we moved into the house, one of the white-painted tables became the stand to our living-room TV. The other was placed in the guest room, and functioned as my very own sewing/crafting table. Ultimately, we decided we could find another sewing table at a garage sale, thrift store or on Craigslist, so I forfeited the white table to be the base of our soon-to-be dining table (my sewing machine currently sits on the floor in a corner of the guest room - how sad!). Before we even decided on building our own table, Eric pointed out a Craigslist ad where someone was giving away a few bundles of wooden planks somewhere on Milwaukee's East Side. We've got a few "rustic wood" projects up our sleeves, so we jumped at the chance to pick up some free materials. I drove over to the East Side and, sure enough, the bundles were sitting out on the side of the street. I grabbed three bundles of probably 20 planks each. They were worn perfectly - I couldn't wait to start a project with them! First, Eric chose some of the planks that were in the best shape (not warped, not filled with holes, relatively similar in size/length) and did his best to sand them and get most of the prickly, splinter-inducing pieces off each one. Then, he applied a sealing coat to each plank to make sure the surface was smooth and splinter-free. The sealant really changed the look of the planks by somewhat sprucing and shining them up, but I'd rather have a shiny table than splinter-filled elbows in the end! Next, he took smaller planks from the bundle and used them to nail all of the planks together. The next step was attaching the newly-built tabletop to the existing white table. 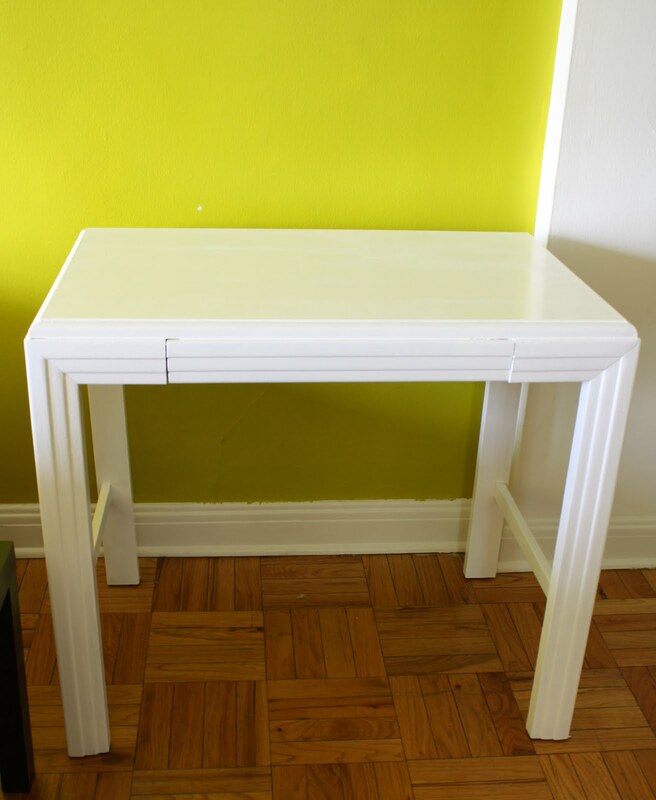 Eric used some ultra-heavy-duty mega glue and applied it to the top of the white table. Then he pressed everything down for a couple of days using the necessary tools. Naturally, those would be a bowling-ball-in-bag, and your standard copy of Natural Wonders of the World. Finally, after pressing down the boards and letting the megaglue set for a couple of days, he screwed the edges down, working from the bottom of the white table, just to make sure everything was placed down absolutely tight and sturdy. Now, of course, if we want to actually sit at this table, we must have chairs, correct? Unfortunately, I don't think Eric's carpentry skills are quite up to crafting quality chairs just yet, so for these I think we'll have to open our pockets a bit more. To balance out the rustic quality of the table, we are thinking of something a little industrial and a little minimalistic and streamlined. One option I really like is this industrial set, found on Overstock.com. For something a little more modern and simple, I also like a few options from IKEA, especially these and these. Once we get our chairs, it will be nice to have a place to actually sit and eat in comfort. And a place to blog aside from my lap. Because it's a small table, I don't think it takes away from the rest of the decor in the "French room" too much, and once I make a proper table runner and add some little tabletop accents, everything will go together perfectly. Even if everything's not perfect, in the end it's just a place to eat our food. You guys make me feel lazy. The table turned out really well!